HealthCentral's “Back to the Basics of Nutrition” #HealthTipsChat was a great success The chat, which coincided with National Nutrition Month, gathered almost 270 twitter participants, and included great contributions from influencers such as the Your Weight Matters campaign and Montefiore Medical Center. Special guest moderators included Berkeley Wellness, renowned food policy expert Marion Nestle and the Obesity Action coalition, who shared their invaluable expertise and helpful resources. Together we were able to answer fundamental nutrition questions, and dispel common diet myths. Missed the chat? Don’t worry! We’ve included top highlights of the conversation in our Storify below. A big thank you to all of our moderators and participants for such engaging and informative discussion! March is National Nutrition Month, and we’re celebrating by getting back to the basics of nutrition with a special #HealthTipsChat on Twitter! Join us on Monday, March 23rd from 2-3 p.m., EST as we tackle your essential nutrition questions and bust through common diet myths. HealthCentral will be hosting the event from the Twitter handle @HealthCentral, and you won’t want to miss the expert answers and nutrition tips from our guest moderators. Joining us will be renowned food policy expert Marion Nestle (@marionnestle), Berkeley Wellness (@BerkeleyWell), and the Obesity Action Coalition (@ObesityAction). First time to the chat? Simply use the hashtag #HealthTipsChat when posting throughout the hour on Twitter, and don’t forget to continually refresh all posts in your "All Posts" feed to read the most recent conversations and follow along. Mark your calendars, and join us on March 23rd! 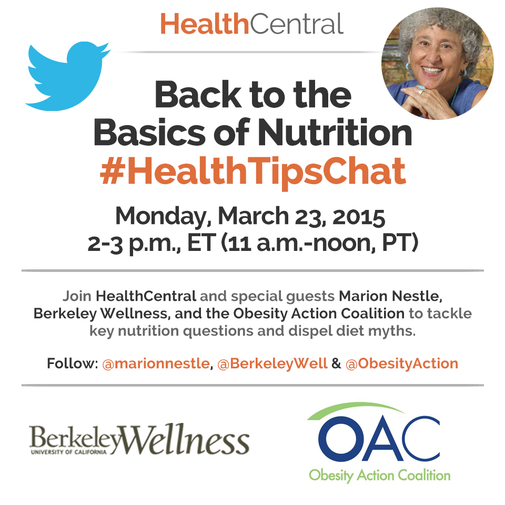 We are so pleased to have Marion Nestle, Berkeley Wellness, and the Obesity Action Coalition to share their expert nutrition advice during this month’s #HealthTipsChat. Marion Nestle is a Paulette Goddard Professor in the Department of Nutrition, Food Studies, and Public Health, and Professor of Sociology at New York University. She has written several popular books on food policy, and is the author of the well-known blog, Food Politics. Her latest book, “Soda Politics: How Advocates are Taking on Big Soda (and Winning),” is will be released in September, 2015. ** Berkeley Wellness** is a collaboration between the School of Public Health at the University of California, Berkeley, and a national team of writers and editors, delivering the leading source of evidence-based health and wellness advice. The Obesity Action Coalition is a national non-profit organization dedicated to giving a voice to the individual affected by the disease of obesity, and helping individuals along their journey toward better health through education, advocacy and support.